XyChat is a secure messaging app for organizations to make team communication more easier and efficient. Admin’s control - a web-based dashboard available to create and manage members, messages, data and message boards. Start a discussion, share audio’s/video’s, and much more in the Message Board (message board serves the functionality of listserv along with features of a group conversation). Quick access to all your colleagues under Company Directories list. Get to know about who’s online and strike up a private conversation with them. You can also add fun, with XyChat’s own functionalities like Disappearing messages, Quick swap conversations, Doodles, etc. Best of all, what you share is completely secure and private – your messages are encrypted in transit and deleted from the servers after delivery. •	Message Board - A typical group like conversation where the members can subscribe the message boards from the list and be a part of it. Share files, start a discussion and keep your team always informed of what’s next. 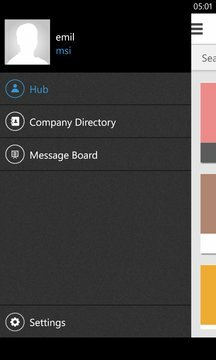 •	Company Directories – Find all your colleagues when they join XyChat. Once they are active, you can invite them to join a conversation. •	Quick swap conversations – XyChat's unique avatar strip which lies along the length of the conversation screen allows you to switch between conversations effortlessly. So you can stay within the conversation context and switch between conversations without ever having to leave the screen. •	Disappearing messages – All the text, picture, video or audio that are sent can be set to self-delete within a particular time, leaving no trace of it. •	Group messaging – XyChat allows you to create groups with more than 250 members. No matter how big the group, you will never notice any difference when you switch to a group chat from a regular chat.